Do you make “to-do” lists? I use them all the time. I use them at work nearly every day to help prioritize my tasks. I also use them at home to make sure chores get done. It is a great way to lighten the burden of things to think about, or better said, worry about. Currently, I am studying for the grueling Chartered Financial Analyst (CFA) examination and am trying not to concern myself with too many other things. Are we taking the appropriate amount of risk in our allocation? Are we well diversified among all of our assets? Are we contributing enough for our future? 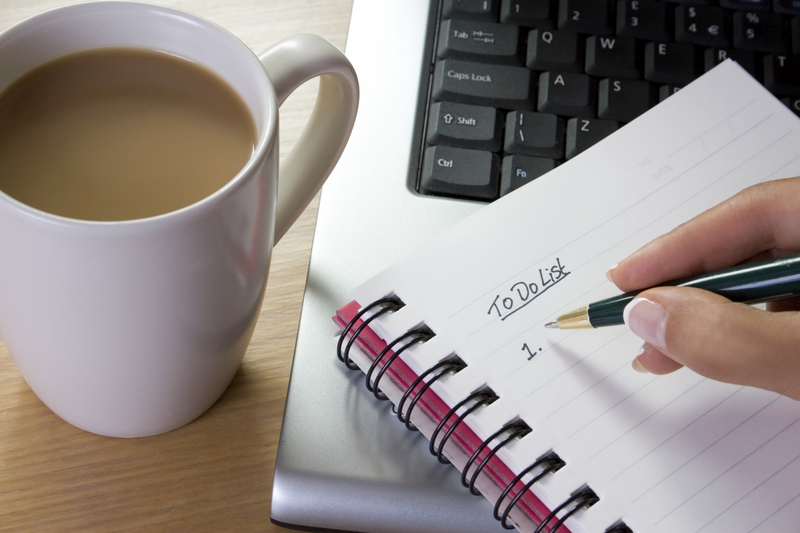 Typically on a to-do list, you would prioritize the urgency of each item. Many seem to put “saving for retirement” on the back-burner, which might not be the best place for it. Some rely on Social Security benefits, but that may not go as far as you may think. The payout may not even be enough to continue a pre-retirement lifestyle. Furthermore, for younger entry-level employees, there may not even be Social Security benefits by the time they reach retirement. It is important to start saving for retirement as early as possible. 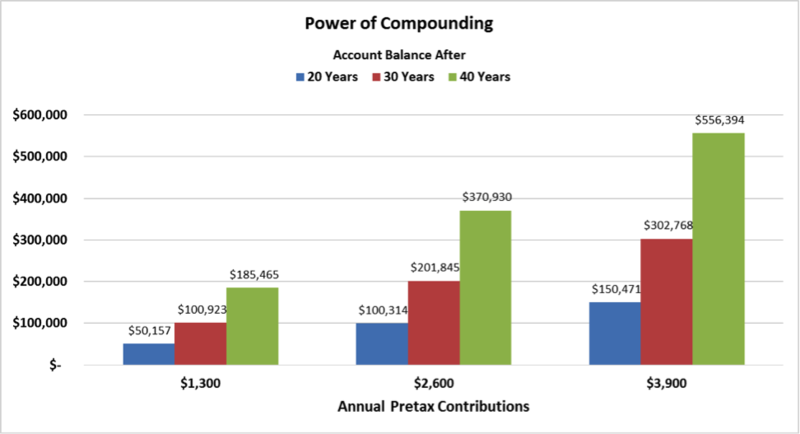 The small amounts that you add to your retirement now really do add up over time through the power of compounding. Case in point, the earlier you start, the better. Employers have made it easier than ever to save for retirement by offering 401(k) retirement plans and even matching contributions to a certain amount. The contributions are automatically taken as a payroll deduction and best of all, pre-tax (although you will have to pay the taxes in the future when you take distributions; a Roth account allows contributions post-tax but distributions are tax exempt). Actually, one of the main benefits of these 401(k) accounts is that earnings grow tax deferred, meaning you don’t have to pay taxes on yearly capital gains and income, and this compounds the savings even higher over time. An automatic payroll deduction to a 401(k) can save you from yourself, which is especially useful for those that try to spend every penny they earn. The long-term average for yearly stock market returns is 10.6% and is 5.6% for fixed income returns. Diversification is the key to long-term investing, so we will allocate 60% to stocks and 40% to bonds (a fairly moderate portfolio). The long-term yearly inflation average is 3.2%. Don’t forget that simply holding onto cash loses you money through inflation’s erosion. As you can see in the chart below, which demonstrates these assumptions, small increases in contribution amount and time can have a magnifying affect. These incremental savings are what will allow you to plan for a better lifestyle in the future. After all, there is still a life to live after retirement. In fact most consider it (and use it) as a perpetual vacation. Sounds great, but unfortunately, it costs money to travel the world on a perpetual vacation. In addition to compounding effects, it is important to stay consistent with your retirement savings. If money is ever tight, perhaps cut back on discretionary spending: eat out less, hold off on that new car, etc. so you can try to keep up with saving. Also, don’t forget that compounding works both ways: compounding interest on debt can be a good way to go broke. On the other hand, compounding returns on investments can be one of the best ways to increase wealth. It’s time to put your future higher on the to-do list and raise the priority of your retirement savings! *Source: Ned Davis Research Group, Ned’s Insights, April 13, 2015.